Most of you would agree with this quote (oh I also do, believe me), but my mind tells me to look at the other side and explore what lies behind wondering. I remember the moments when I kept thinking about things that could have happen had I not know about the real deal. I would always make beautiful stories in my head because I’m unaware of what is happening, or what could happen. They brought smiles to my face and I like it. Because at least, even for a little while, I become happy. We wonder when we’re worried, because we care about someone. We wonder about what ifs, because until now we cannot completely move on. We wonder why, because we gave our trust to that person. We never wonder just because, for there is always a reason. It is nice to wonder. The emotions that you get, even if they’re not as real, makes us feel alive. The sudden thump in our hearts or the sweat that runs on our faces while we think, while we imagine, while we wonder. They may be half as true but they sure keep us awake and existing. 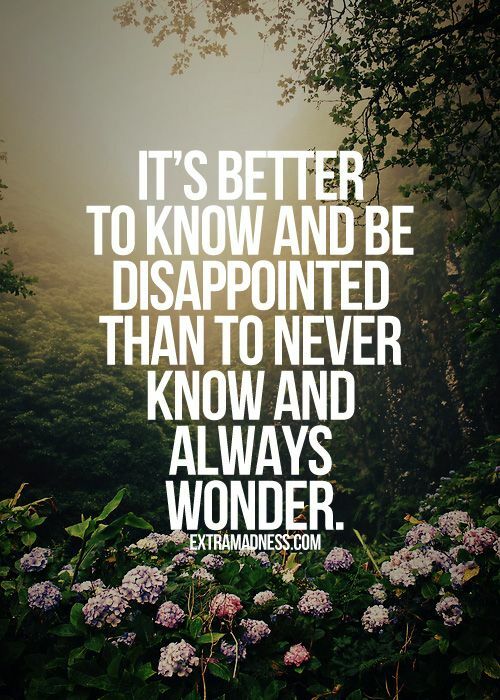 But still, it’s better to know than to always wonder.